Here is the Instant Pot Pot Roast recipe you have been waiting for! 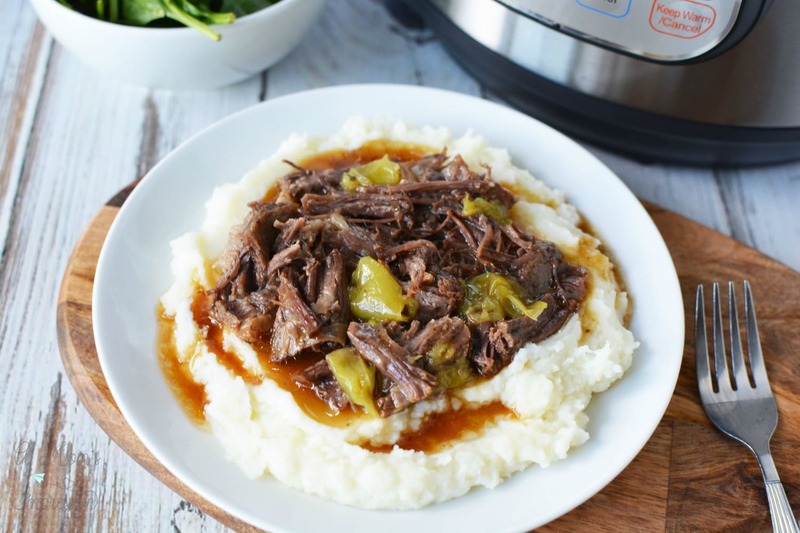 Instant Pot Mississippi Pot Roast is unbelievably packed with flavor. This classic beef roast is made with au jus, ranch and beef stock for a fall off the bone tender recipe that you are going to love. The best part? Using your pressure cooker, you get it on the table in less time than in the oven or Crock Pot. There is something very comforting about pot roast. Maybe because I remember having it when I was a child. Or maybe it is because of how easy it is to make? I am not sure. 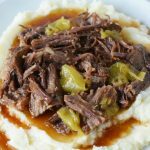 What I am sure about is that this Instant Pot Mississippi Pot roast recipe is delicious and hands down the best beef pot roast recipe I have ever eaten. Using your pressure cooker, this roast is done is half the time it would take in the oven and far faster than a slow cooker method. (I did include slow cooker instructions after the printable recipe at the bottom of the post) I love using the Instant Pot for recipes that traditionally are slow cooked like this Instant Pot Chicken Gnocchi Soup and this Instant Pot Corned Beef recipe. The flavor that a pressure cooker can bring is amazing! For tips on how to use an electric pressure cooker check out our pressure cooker guide. Quite simply, Mississippi Pot Roast is the best roast you will ever eat! It is a cut of beef combined with broth, ranch dressing mix, au jus mix, and pepperoncinis. Traditionally this beef roast is made with butter, but I omitted it and I don’t think it needs it. Any time I can cut a few calories I try to do it. What cuts of beef are the best for Mississippi Pot Roast? Just another reason to love Mississippi Pot Roast is that you can use all kinds of cuts of meat. I see chuck roast for sale all the time at my local grocery store which is why I am using this particular beef. I stock up when I see it on sale so I can make this recipe. The key to getting a rich, delicious flavor is to brown each side of your beef roast. If you need to you can always cut up your roast into large chunks to get it browned easier. I love that you can do all of this right in the Instant Pot using the saute mode! I typically don’t like ranch powder packets on things as they seem too salty, but this wasn’t like that at all. When combined with the au jus and the pepperoncinis, this was such a rich flavor! 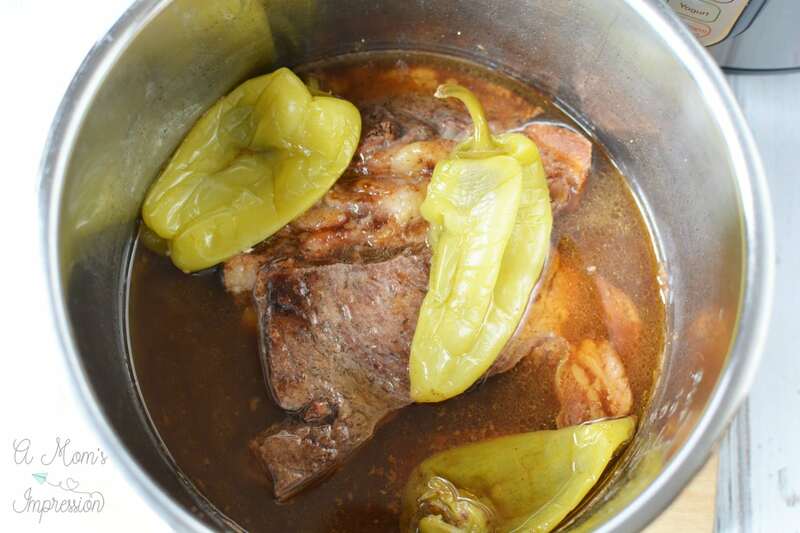 It will be the best Instant Pot beef roast you will try. Another tip is to be sure when the cooking cycle is complete, to let pressure naturally release for 20 minutes. If you quick release the pressure at this point you run the risk of the meat toughening up. Resist the urge to make it go faster and wait the full 20 minutes. This pot roast is so tender that it will literally fall off the bone. Shredding has never been this easy. 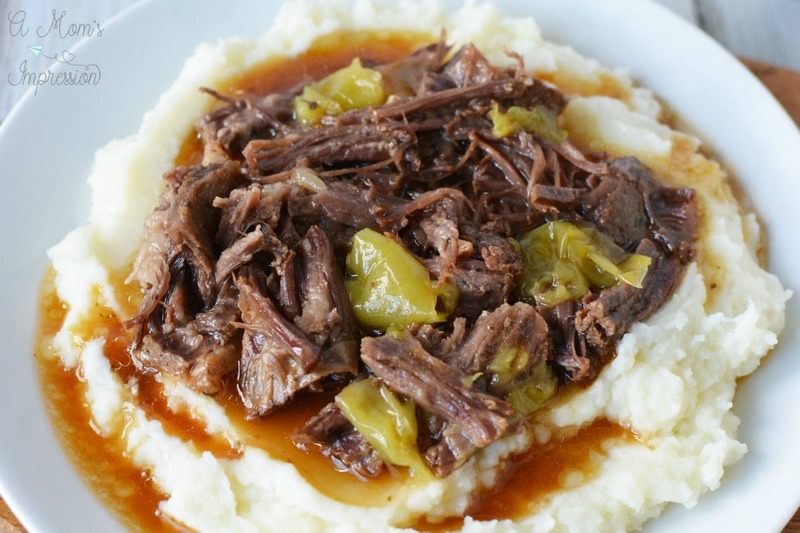 We like to serve this Mississippi Pot Roast with Instant Pot Mashed potatoes. There is nothing better than meat and potatoes! Here is the Instant Pot Pot Roast recipe you have been waiting for! 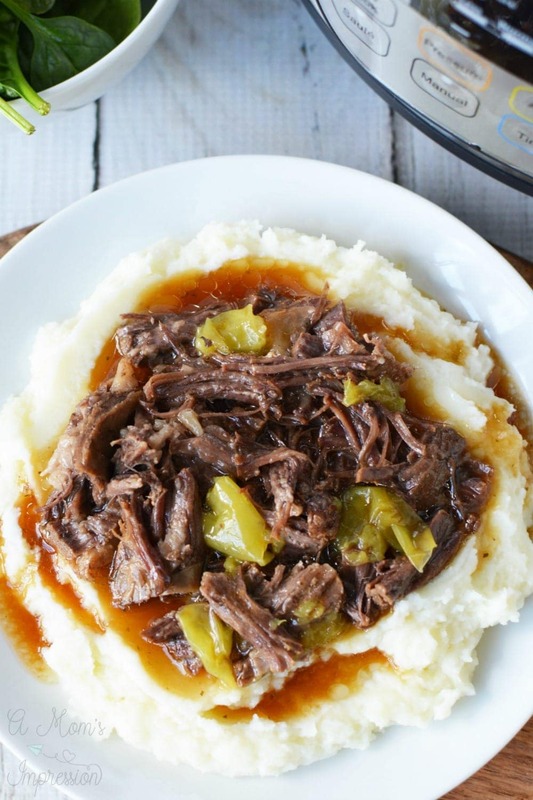 Instant Pot Mississippi Pot Roast is unbelievably packed with flavor. This classic beef roast is made with au jus, ranch and beef stock for a fall off the bone tender recipe that you are going to love. Place oil into the Instant Pot and place roast in pot. Sautee on each side until browned. Add broth and sprinkle seasoning packets on top of roast and in the pot. Place peppers on top of roast. Place the lid on the Instant Pot and seal shut. Close the pressure release valve. Set the Instant Pot to manual, high pressure for 45 minutes. When the cooking cycle is complete, let pressure naturally release for 20 minutes. Open the lid and use two forks to shred the beef and remove bones, or remove roast from pot and slice and shred on a plate. Remove peppers from pan and cut with a knife, discarding seed bunch and stem, and mix in with the beef. Return beef to pan and mix with juice. Serve over a bed of mashed potatoes if desired. Making Mississippi Pot Roast in the slow cooker is simple. It is an easy dump and go method. Place everything in your slow cooker and turn on low for 8 hours. 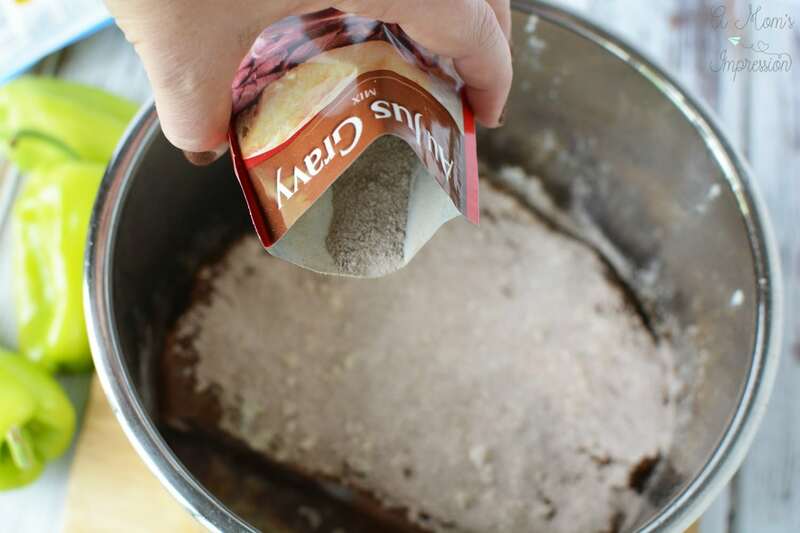 For a reacher flavor, brown your roast in a skillet before placing in your slow cooker. I made this recipe exactly as written and it was amazing. I was actually a little bit dubious about this recipe but my wife and I thought it was delicious. Thank you for your recipe. I definitely will make it again. I am so happy you and your wife liked it! I thought it strange at first, but it has become one of our favorites. The total time on this needs to be dramatically updated. It does not take 45 minutes. It’s 45 minutes + 20 minutes release + time to come to pressure. After browning the meat and shredding, you’re closer to 1 hour 30 minutes total time.